Audio connoisseurs know that all links in the signal path are as important as the next. Furutech engineers solutions that optimize every pathway and junction; any unaccounted for characteristic weakness (i.e., contact resistance, EMI-radiating junctions, RFI) diminishes performance as noise and distortion builds. Using the best materials and processes available along with meticulous attention to build quality is a large part of the Pure Transmission engineering equation: The fuse is equipped with rhodium-plated OFC copper caps and a special low-inductance copper alloy conductor, ceramic body with special damping filler. All metal parts treated with Furutech's patented Alpha Super Cryogenic and Demagnetizing process. These beautifully made audiophile fuses are engineered to withstand 1 nanosecond at a full 1500 watts, and rated at 125mA/6.3A. Plug a Furutech power cord into one of their high performance outlets covered with the exquisite resonance-damped carbon fiber-over-stainless outlet cover to an e-TP609 power distributor or e-TP80 filtered AC distributor, equip your front-end components with high performance fuses and power cords, and you've gone a long way towards a powerful, satisfying musical experience. 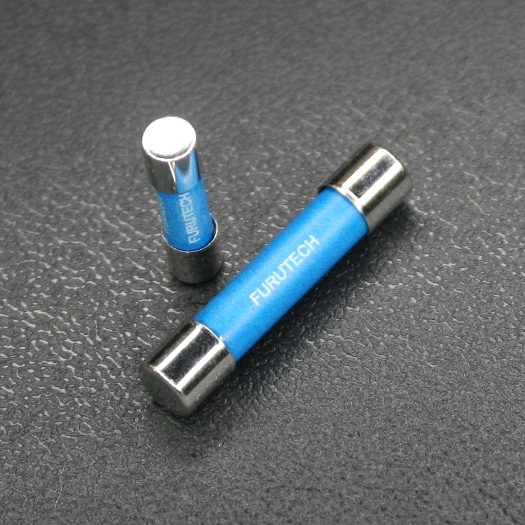 When upgrading to Furutech TF fuses please make sure that the fuses being replaced are the component's original fuses. Especially if the component has been purchased as a used component. If unsure, contact the component manufacturer to confirm the correct fuse value required before replacing the fuse.